For all Sacrament inquiries, please contact the Parish Office directly either in person or by phone. Congratulations on the birth of your child! Before celebrating your child’s baptism, there are a few items that will need your attention. If you have not yet registered with the parish, please do so. Church Law allows a Pastor to baptize only those who are registered parishioners of a parish. If you are returning to St. Mary’s to celebrate with family here, we will need a letter from your Pastor giving permission for your child to be baptized at St. Mary’s. It is a requirement that you attend a Pre-Baptism Class here or at your parish. Again, a certificate of attendance is needed if you attend the class elsewhere. To register for a Pre-Baptism Class here at St. Mary's, please contact the Parish Office at 315-635-5762. It is customary that the child have a Godfather and a Godmother. At least one of these individuals must be a practicing Catholic. They will need to supply a Certificate of Sponsorship from their Pastor before the celebration of the baptism. It is policy in the Diocese of Syracuse that children who are to be registered in First Sacrament Preparation (First Penance and First Communion) must have attended Faith Formation Classes at least one year prior to their registration. * This will ensure that the children have a good foundation to begin their preparation for the Sacraments. To register for this program, please contact the Faith Formation Office. *Students who attend a Catholic school are exempt from being in the program one year prior to registering for the sacrament and are not required to attend weekly classes for Faith Formation, however they are required to attend the 5 sacrament prep workshops throughout the year. The Sacrament of Reconciliation (Confession) is celebrated each Saturday from 3:15pm to 3:45pm in the Church. You may also call the Parish Office to set a time for Reconciliation with the Pastor. It is the policy of the Diocese of Syracuse, that those young adults registering for Confirmation Preparation must have been active in the Faith Formation Program for at least one year prior to their registration. This means, that they must have been in class for their 8th Grade year. * Confirmation Preparation is a two year program beginning in the Fall of the 9th Grade Year with Confirmation being celebrated in the Spring of the 10th Grade Year. To register for this program, please contact the Faith Formation Office. *Students who attend Catholic school are exempt from being in the program for one year prior to registering for the sacrament, however they must attend Year 1 and Year 2 of sacrament prep to be eligible for Confirmation. Arrangements for your wedding should be made at least six (6) months prior to the wedding date. This is a diocesan regulation. Diocesan regulations do not allow the celebration of weddings on Sundays and certain Saturdays according to the Liturgical Calendar. To be married at St. Mary’s, one party should be a registered member of the parish. If not registered, permission from the bride or groom’s pastor will need to be obtained. Marriage Investigation: It is a requirement for all couples who seek Catholic marriage to complete this form. As a canonical (legal) form the questions asked ascertain the freedom of the parties to marry and their understanding of the duties and obligations of marriage as taught by the Catholic Church. Pre-Marriage Inventory: This “inventory” is a standardized questionnaire which evaluates the couple’s knowledge of one another and their readiness to marry. Each couple is required to meet with their Sponsor Couple for at least three meetings to discuss the findings of the inventory. Preparing Your Wedding Ceremony: When meeting with the Pastor, the couple will be given a selection of the readings and the prayers to be chosen for your ceremony. After the choices have been made, you will need to review them with the priest who will witness your ceremony. This meeting should take place at least two weeks in advance of the wedding. At that time the whole of the ceremony will be reviewed in preparation for the rehearsal. At this time a Wedding Coordinator’s Form will also be completed in preparation for the rehearsal. If you have a family member at home or in one of our local hospitals, and want to celebrate the Sacrament of Anointing, please call the Parish Office to set an appointment with the Pastor. Also, the residents of Syracuse Home at McHarrie Place are anointed twice a year. The Vigil Service for the deceased is an important part of the funeral rite and should not be eliminated. A priest, deacon or lay person may preside at this rite. At times this rite takes place approximately 20 minutes before Calling Hours begin. The ritual consists of scripture, and intercessory prayer. The heart of the Funeral Rites is the Funeral Mass. The Funeral Mass focuses, not on earthly life, but eternal life. This Mass celebrated for the deceased commends the soul to the love and mercy of our Heavenly Father. The prayers of the Church entrust the individual to the care of God who has called our loved one to Himself. Our prayers to God entreat Him to be gracious and merciful, not looking upon the sins of the past but to the glory they are to share with Christ. “Having been baptized into His death, we hope to share a resurrection like His.” (Romans 4) This liturgy also offers comfort and consolation to those who mourn. The Mass lifts our hearts to God who will strengthen us in the days ahead and give us the grace of His comfort as we continue our journey of faith. As in all liturgies, music is sung prayer and plays an integral role in the Funeral Mass. It allows us to express our faith, love and hope, drawing us closer in unity to our faith. While favorite songs that are popular or secular may hold special meaning to the deceased and the family, this type of music is not appropriate for the Mass nor is the use of recorded music. The family is invited and encouraged to be part of the music planning for the funeral liturgy. The Mass lifts our hearts to God who will strengthen us in the days ahead and give us the grace of His comfort as we continue our journey of faith. 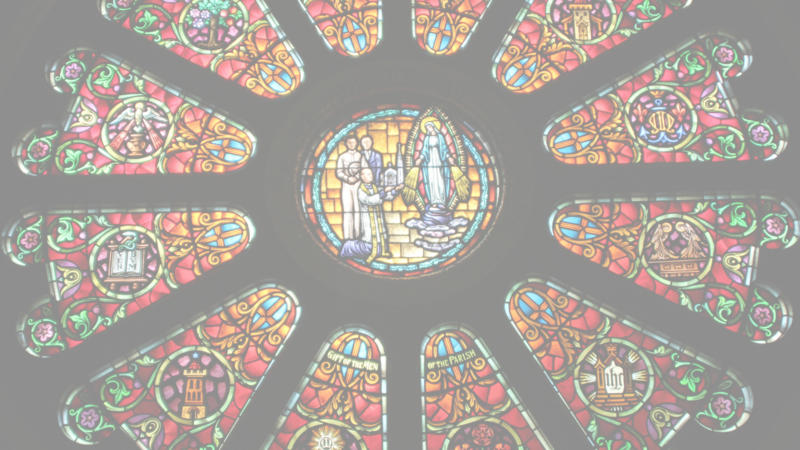 The parish musician, priest, or those assisting in the preparation of the funeral Mass, can be helpful in assisting in the choice of suitable hymns and the placement of music selections. Many churches have soloists and choirs that sing at funerals, enhancing the liturgy, honoring our loved one through sung prayer. The last of the rites in the Order of Christian Funerals is the Rite of Committal which includes a verse from the scriptures, a prayer of committal, intercessions, the Lord’s Prayer and a blessing. If desired, music may be added to the Rite of Committal. This rite should take place directly after the Funeral Mass at the time of burial. A priest, deacon or lay person may preside at this rite. Canon Law states that the Church allows both cremation and burial as means of honoring the body of a deceased Catholic. The Church clearly prefers and urges that the body be present during the Vigil Service and Funeral Mass, and if cremation is selected, then it should follow the celebration of the Funeral Mass. The remains are to be placed in a worthy vessel which is then carried and transported with the same respect and attention given to a casket carrying the body.